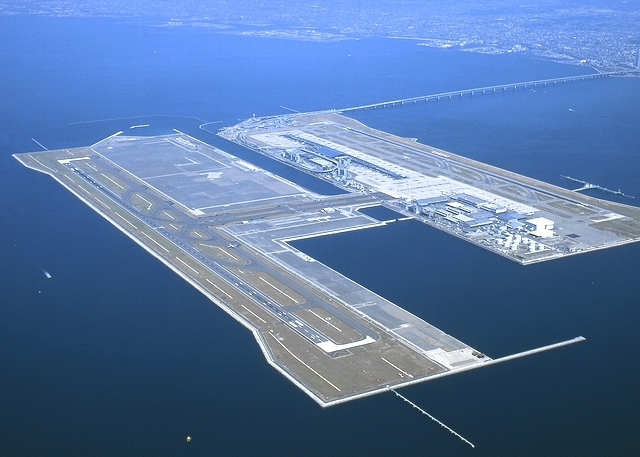 Kansai International Airport Second Phase Land Development Project . Rapid, Large-Scale Construction of a Man-Made Island Making Full Use of Advanced Information Technologies on Very Soft Seabed in Very Deep Water . Kansai International Airport Land Development Co., Ltd.
関西国際空港2期用地造成事業は、さらに増大する航空需要に対応し、4000m級の複数滑走路を有し、完全24時間運用可能な国際空港の整備を図るため、供用中の1期空港島の沖合に2期空港島を造成する事業である。事業実施にあたっては、「1期に学び、1期を超える」、「より早く、より安く、より良く」をスローガンに、綿密な事業計画を策定するとともに、最新の情報化施工技術の積極的な導入や様々な施工上の工夫を行う等の効率的かつ精度の高い施工を実施した。その結果、本事業は、大水深で超軟弱な海底地盤において、大幅なコスト縮減を図りつつ、強固で安定した空港用地の造成を早期に実現させ、土木技術と我が国の発展に大きく貢献したプロジェクトとして評価され、技術賞に値するものとして認められた。 This project involves the development of the 2nd airport island of Kansai International Airport 200m offshore from the existing first airport island in order to increase the capacity of the first international airport with multiple 4,000m-class runways to operate around-the-clock in Japan. An efficient and accurate construction was carried out under the slogan of "Learn from the first, Surpass it" and "Faster, less expensive, and higher quality," in which several improvements and developments were made in regards to the preparation of a detailed and elaborate implementation plan, utilization of advanced information technologies and of various construction technologies and devices. An early completion of the airport island on very soft seabed in very deep water and a significant cost reduction were achieved in this project. The new runway has been in service since August 2nd 2007.